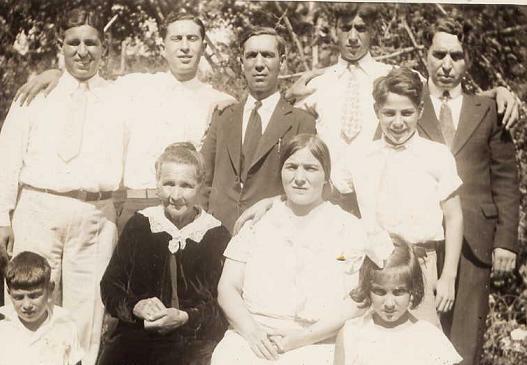 The Geremontes—an old family from a mountain-village near Naples, called San Giovanni di Fiore—were a few among the thousands of Italian-American immigrants arriving in America around 1900 through Ellis Island. In the old photo below that was taken on our family’s small Stoneham farm, you can see at left my great-grandmother Philomena, her daughter my grandmother Barbara, and the little girl is my mother, Irene. At the right side (end) of many fine grand-uncles and other relations stands my maternal grandfather, Antonio Geremonte. They were brave, able and independent people whose first priority was always each other. They enjoyed every minute of being alive and each other’s company. When Barbara left the village on her own to avoid a pre-arranged marriage that would have enslaved her, she met Antonio in one of the family’s first groupings in Chicago. 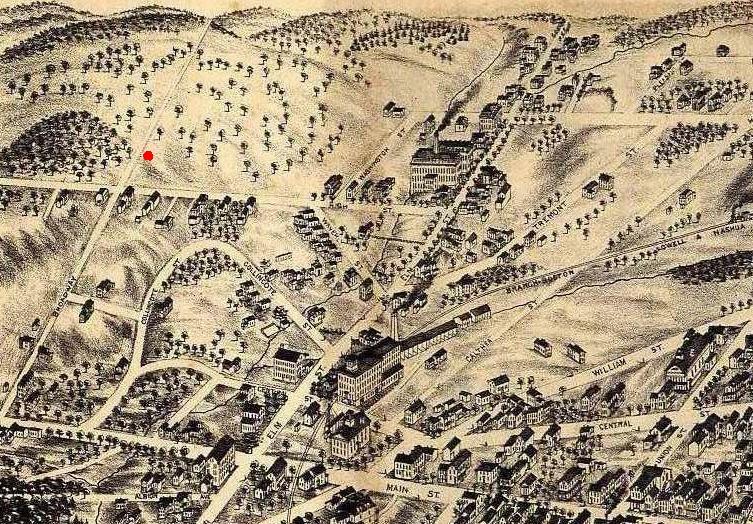 Soon they were rooted in Stoneham, Massachusetts, a little “shoe town” near Boston 200-odd years old: working trades and digging the Spot Pond Reservoir, selling crops at a fruit-stand and making their little place off Spring Lane also serve as a rooming house. These were all people who knew how to share, how to sacrifice and build. The older men here were WWI veterans, and the younger all served in WWII. (Stories/images from their harrowing experiences at AncientLights.org’s Dedication Page). 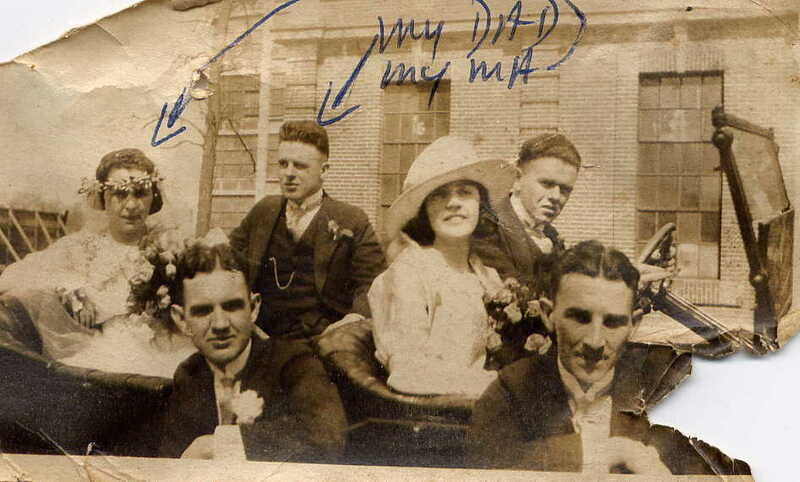 My father John T. Dempsey, meanwhile, was the soon-to-be son of the rugged-looking Boston Railroad detective you see getting married below, around 1920, to his bride Sadie Cawley. I still don’t know how long it was before this that these Dempseys had come over to America from Ireland. 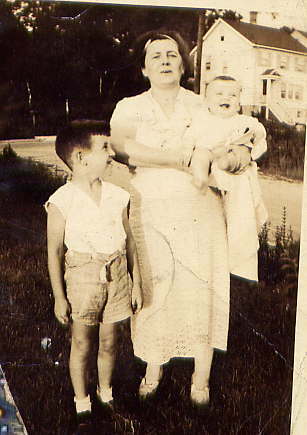 But just below the wedding-party, that little boy with the rope-belt around his skinny waist is my father, growing up in Jamaica Plain near Boston with his mom and little brother Bobby. 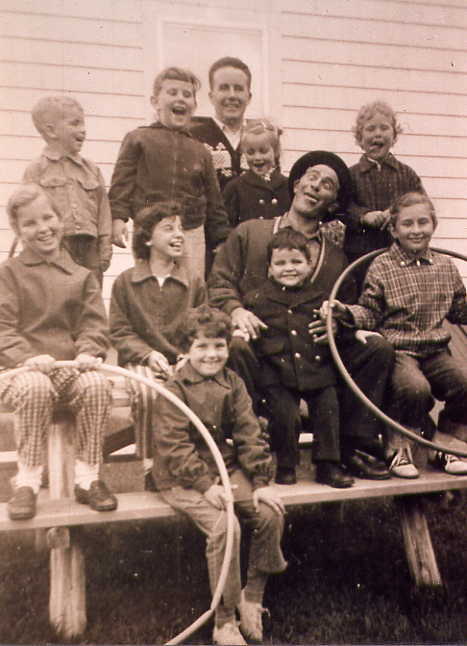 My father was 9 years old when the Great Depression struck and his father died suddenly at the same time. No wonder that he and the other three young kids acquired all the independence and skills and love of their bonds that I saw in them as adults when I came along. It was pure survival, and then World War II was upon them all. For all that and the hard-won wisdom they already possessed, they kept getting educated, too. The absolute fact that always brings back my inborn happiness is—I would be nothing without them. I stand at their graves and I have no problems. Every day of my life I stand on their shoulders. Anything worthwhile I’ve done is because of them, period. And this is just the main spring of so many other people to whom I am grateful for being my teachers, friends, helpers and heroes all my life long. One of the most powerful and probably the craziest was my late beloved uncle Frank M. Geremonte (whose war record you can explore at my main website). Yes, that’s me the lucky one that day among my cousins who got to sit in Frank’s lap for the picture—our family’s first Ph.D. (in law from Northeastern), a pool shark and Town Selectman, born comedian, State Amateur Golf Champ, and a gentle, eloquent, strong and true man of the world, for his family and his town. You can’t get more lucky than to have many amazing fathers. And mothers. While living among Greek families of Crete in writing Ariadne’s Brother in the 1980s, my mother and father came over for a 2-week visit, and I saw how much alike our happy families were (and still are). In Greek, a word for “happy” (spelled phonetically, ef-char-is-ti-MEN-os) is a close cousin of their ubiquitous word for “thank you” (ef-char-is-TO). As if, in the most gentle way, their very language offers wise advice to remember gratitude in every happiness. Seek out and write down, hoard and cherish and re-tell your family’s story. Without you, invaluable things will disappear. Without family—for all their problems—we are dust in the wind. My first and last “credentials” I owe to these ancestors, and to their children Jack and Irene, who came together here in the house I enjoy today, and made America happen. Thanks to them, the only complaint I can have is that I didn’t get to know them all even better and longer. Credentials and more family history at http://www.ancientlights.org . “Ancestral Gratitude” — love it! I guess I can leave a grand reply here. I say “grand” because I’ve just read your whole blog. Every page, every word. It took me an hour. It’s 4 AM and I couldn’t sleep. I had read a comment you made about a video I made and that’s how I got here in the middle of the morning. You’re a fine, fine writer. A truth teller. I suspect you’re in pain about as much as I am. I’m a few years older, but you’re just as wise and lonely and content with life. My video, under ClassWarFilms, is called “Let Your Life Be a Friction to Stop the Machine”. 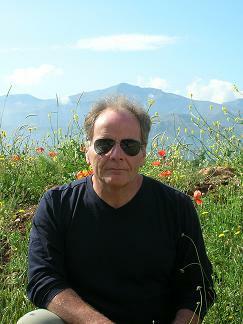 Hello Lanny—-Thank you so much for reading here, and as much for writing. I woke up this morning in a pit of disgust and despair at what continues to go on as “business as usual” in our hollowed-out democracy and our dying natural world, and you changed that to something else, something similar to the spirit of Che Guevara whom you quoted in one of your outstanding films—“Let us be realists: let us do the impossible.” I really look forward to talking with you directly (thanks for your phone number), and for now can only hope that millions and millions of Americans and world citizens will watch and be energized by the clear, focused, detailed and eloquent words and images of your ClassWarFilms. We the people and our planet are being eaten alive by the criminal corruptions of capitalism while “our free media” sing distracting music—and I hope these messages between us mark the beginning of an answer, IN ACTION. God bless you, my friend—-and, Peace. Thanks, Dana! Finally have my computer at the new home here in Crete so send some emails when you can to jpd37@hotmail.com and keep me up on family news, OK?